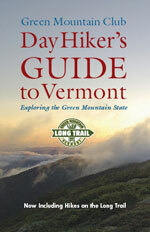 Day Hiker's Guide to Vermont, by Green Mountain Club, 6th Edition, 2011. Latest edition of the Green Mountain Club day hiking guide now covers many hikes on the Long Trail as well as many other across the state. More than 200 hikes are described, presented in an attractive and compact format with color page maps. The trails are organized by region and cover all the Vermont 4000-footers, other favorites such as Mt. Equinox, the Worcester Range, and the Lake Willoughby area, and many lesser-known peaks and lowland rambles. 432 pp, 4 1/4" x 6 1/2".